Exhibition opening hours are generally restricted to the opening hours of the church (see here). If you would like to visit the exhibition outside of these times please ring the church office well ahead of your visit so that we can ensure access. 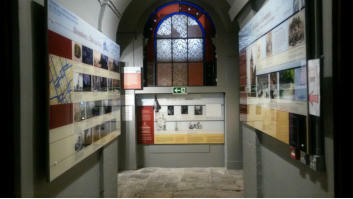 Recently remodelled and relocated, the exhibition is in the undercroft entrance beneath the church. Access to the exhibition is below the front of the tower at the eastern church entrance on Bloomsbury Way, following the signs down the stairs to the Museum of Comedy. Hawksmoor & Bloomsbury tells the story of how St George’s church came to be built and the subsequent development of both the church and its local area. How did Bloomsbury come to be built? Who has lived in this area since Georgian times? What inspired Hawksmoor’s unique design for St George’s and how has the recent restoration project restored this masterpiece of the English Baroque to its original splendour? Come and explore the rich history of this unique part of London and find out how authors (Dickens, Trollope), artists (Hogarth, Turner), socialists, abolitionists and suffragettes have all played their part in the history of Hawksmoor’s most distinctive London church.